Member of boy band "Kis-My-Ft2". Prisca Thomas Mar 23 2018 3:30 pm Careful girls this guy maybe cute, or gorgeous in your cases. I noticed he was born exactly 5 days before my son. He is also cute and girls love him, speaking as his mother cute can be difficult to live with, loving caring but difficult to live with even his friends said so.He loves to complain and is very protective of him belonging. I normally watch BL, but his adorable face kept me watching.I am on part 2 watching on youtube and still hoping it is BL, I can dream can't I.
yumei Aug 19 2017 11:42 pm omg new drama for tamamori bae together with my favorite actors yahhh so happy ❤️ more dramas for tama-chan!!! akane aiko Jul 09 2017 9:46 pm Does yuta Tamamori have an account at Instagram? Fede Jan 08 2015 6:19 pm You should updated his drama section with "Yonimo Kimyona Monogatari Spring Edition 2014"
Lizzie Jan 31 2014 5:26 pm OFFICIAL: 2nd season of Nobunaga no Chef (summer 2014) omedetou tama-chan! ClumsyGirl Jan 25 2014 7:53 pm It's not official yet, but I can't wait for Nobunaga No Chef SP. Tama's shooting in Kyoto in these days. July Jan 18 2014 9:08 pm Tama can play different characters very well (Ren/ Kyonosuke). He's definitely a good actor. He's really cute (but he can be kakkoi too). Keep working hard! You will become one of the best Japanese actors. Chanie Jan 01 2014 6:58 pm Tama is a good actor. I really love his acting in Pin To kona. Please make more drama with Tama in it. winds Dec 20 2013 11:27 am Sorry but Yuta can not act. Gaya and Hikaru stole the show in Ikemen. Plus Yuta can not dance or sing. Why is he popular? his looks? maybe to some people. rosali Jul 14 2013 3:26 pm I have been anticipating his Pinto Kona drama as I have been following Tama-chan's dramas. His acting is improving and he is getting better and better. I just hope that his singing career will improve to be given more singing solos during the Kis-my-ft2\s performance. Tama-chan, keep up the good work!!! Geraldine Jun 11 2013 4:04 am I am seriously fallin in LOVE with him!!!! He's just shooooooooooo freakin CUTE!!! It was when I first saw him acting in Ikemen Desu Ne....he's just so awesome and handsome!!!! OMG.. Someone out there.. Feb 14 2013 7:43 am I have never been much of a fan of any movie or TV drama series that were not English.. I recently started watching them, because a friend suggested. Ikemen Desu ne was my first Japanese, and I must say, considering i used to hate anything other than English, it was impressive. Yuta Tamamori was a unique actor, and i guess that was part of why i like the drama series. Ikemen Desu ne was one of the first drama series i liked besides a couple of Korean ones that are not English... His acting was somewhat... different. Memorable, i guess. Anyways, lets hope i find something, Korean, Japanese or whatever, that is gonna be as good as English ones for me. :) Ikemen Desu ne was near. I think that Yuta Tamamori has a bright future ahead of him. Good luck. rossali Jan 30 2013 7:49 pm I have watched some of Yuta Tamamori's movie/dramas. He is a great actor who is able to portray the role of the character that he is playing. He is very convincing that one can really feel the story. It is of no wonder that he is given lead roles. He is really good in "Nobunaga No Chef". Tamapii Jun 05 2012 11:23 pm He is my current biased!! >.< and yes i think brown hair tama and Jaejong look quite similar. Cindy May 12 2012 6:08 pm I very much preferred the Japanese version of "Ikemen desu ne" compared to the Korean version because of Tamamori-san. You believed Tamamori-san was Ren-san, with all the emotions. Good job! Domo Arigatogozaimashita! robi May 11 2012 6:02 am nice ikemen desu ne ... keep up.arigato. Emily Apr 22 2012 1:00 am Yuta Tamamori is great actor. I liked Ikemen desu ne so much!!! Mary Mar 29 2012 3:59 pm when is he's next drama...cnt wait any longer:( i luv him!! 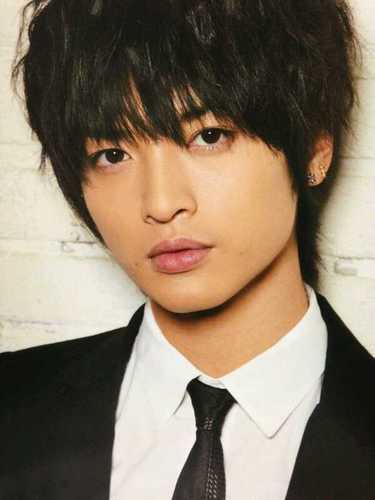 Azmida Jan 18 2012 6:17 pm i'm a fan of him when he acted at Gokusen. Now when i saw Ikemen Desu Ne, i'm more interested in him more! yess minna-san.. i do thought so too, that his face really remind me of JYJ Jaejoong~ such a hottie and their face had a very beautiful side lyk 'onna'~ anyway, hope to see Yuta Tamamori in 2012 movies or dramas (lots of it) ^^ all the best! fun :) Jan 04 2012 12:14 pm is unique! especially beautiful as angels ..... I love his expression in the film when annoyed! noir Jan 02 2012 11:10 pm @katami-san: Waaaaah I thought I was the only one thinking that! Most of his profiles in Ikemen Desu ne reminds me of Jaejoong! Especially when he's hair is wet or not gelled. R.Infinity Nov 18 2011 11:47 pm seksiest man alive~ love ya Yuta Tamamori! you should be in more dramas though . . .
Gohar Nov 16 2011 12:26 pm It really excellent actor! I apologize for the English..... Studied perfectly well, but lessons it was small! :))) I have seen it for the first time in a serial "You is fine"...... His face happens such ridiculous and different...... I am very glad that such person the actor and the singer..... I wish your of good luck and henceforth!!! :))) Truth..... To me it is hardly believed that such occupied the person would create the profile:)))..... But in any good luck cases! Nana Yuki Aug 23 2011 10:10 am hey....when you want to acting another story about Gokuesen... huhuhuhu....I was realy miss Yankumi.... but you are so cool when you become Ren... but you face ware not same when you are the first time act in Gokusen sp and Movie... Good Luck..!!! kirarin023 May 10 2010 10:02 am ., hmmm.. is it your first time filming a movie and tv series?? JEfreak Jan 30 2010 12:17 am i LoVE HiM !!!!! HEs So CUTE !!!!!!!!! Skye Dec 27 2009 1:11 am is it me or he looks like TVXQ/Tohoshinki/DBSK Jae Joong??? well trained is he now debuted?